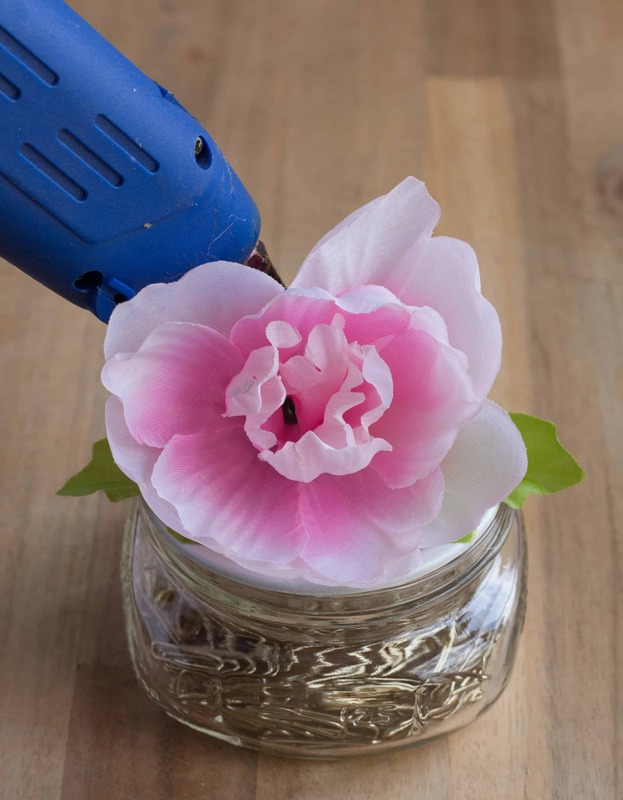 These DIY flower mason jars with flowers are made with flowers from the dollar store. This project can be made in less than 30 minutes. Spring is here and spring is my favorite time of year to craft. I think it is because I adore beautiful pastel colors! A few of my favorite blogging friends and I are participating in the Spring Maker’s Blog Hop where we are sharing a spring DIY with you. 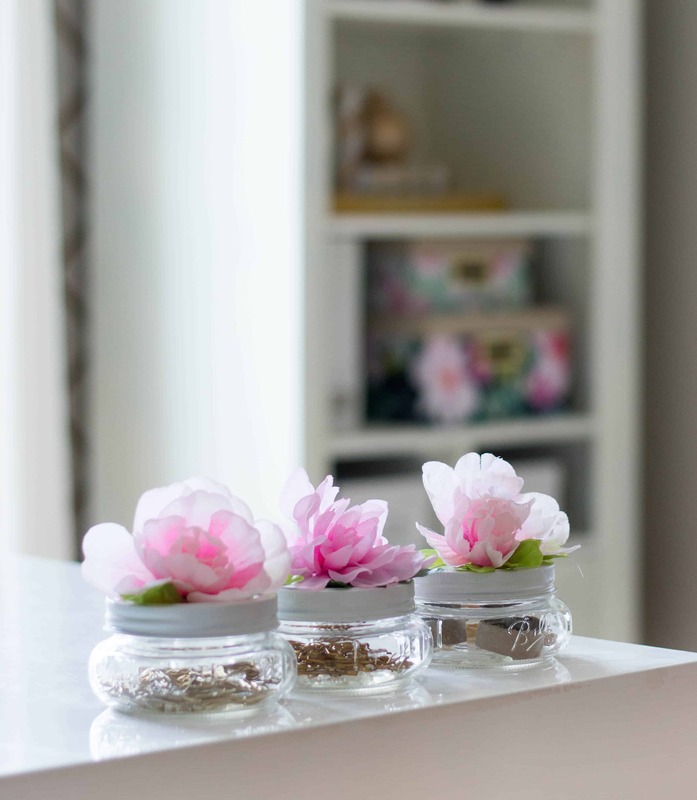 We were given the challenge to make something for spring and I made these DIY Flower Mason Jars for my office. 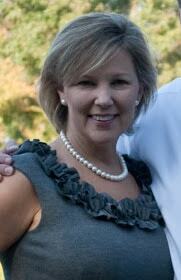 Please visit the other bloggers to see what they have created! spring decor and inspiration you need to kick the winter blues! It seems like the big thing this spring is pretty pastel flowers. You look on Pinterest or walk into stores and peonies, dahlias, and ranunculus are everywhere. You see these beautiful flowers on fabrics, bouquets, and art for the walls. I made over my office for the One Room Challenge last fall and I used metallic gold and white colors in the room. I want to bring in some pretty pastel colors for spring and I think it will look pretty with the gold and white that is in the room. I added some floral storage boxes for my bookcase and placed a flower arrangement on the desk. I had found some cute tiny mason jars and I thought they would be perfect for my office supplies. 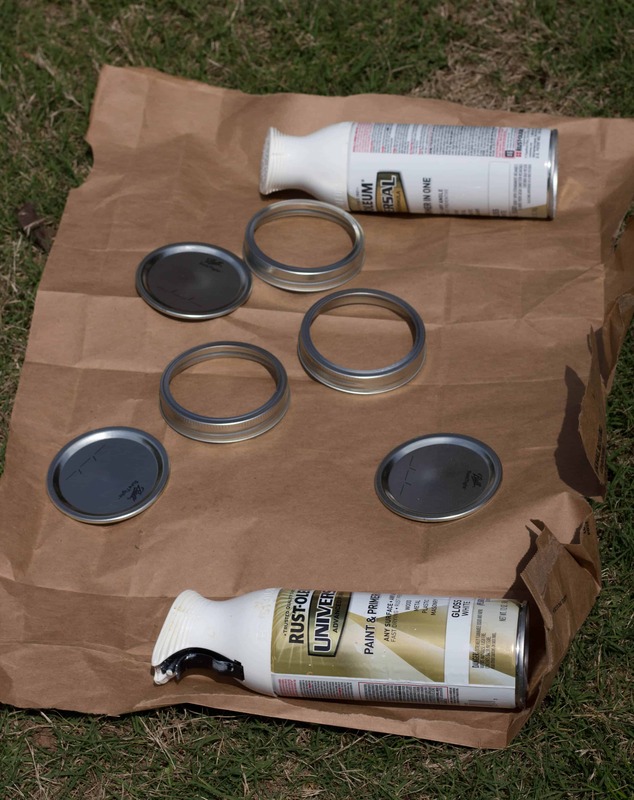 I spray paint the lids with white spray paint. I was very surprised to find some beautiful flower bouquets at the Dollar Store. I added the greenery that was on the bouquet first securing the leaves with hot glue. I cut off the plastic piece that held the leaves together. I also attached the flower with hot glue. 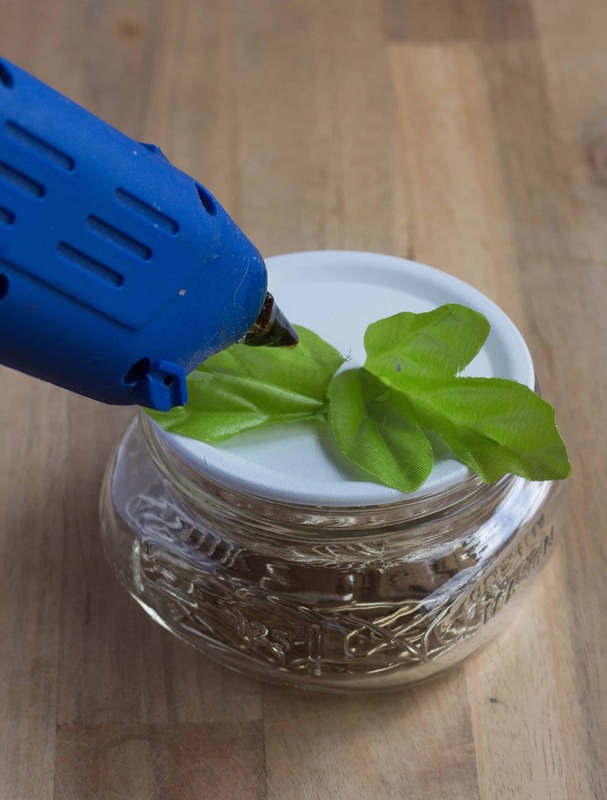 These DIY Flower Mason Jars are perfect for my office desk and add a spring touch to the office. So cute Sherri! I have the same jars in my office too, but never thought of prettying (is that a word?) them up, thank you for the inspiration!! These are so cute and perfect for spring!! I love these cute little jars. Adding the floral stems on top was a great way to springify them. Not only is this an adorable project but I am questioning why I haven’t done something like this in my office. So darn cute. Sherry these are so cute! 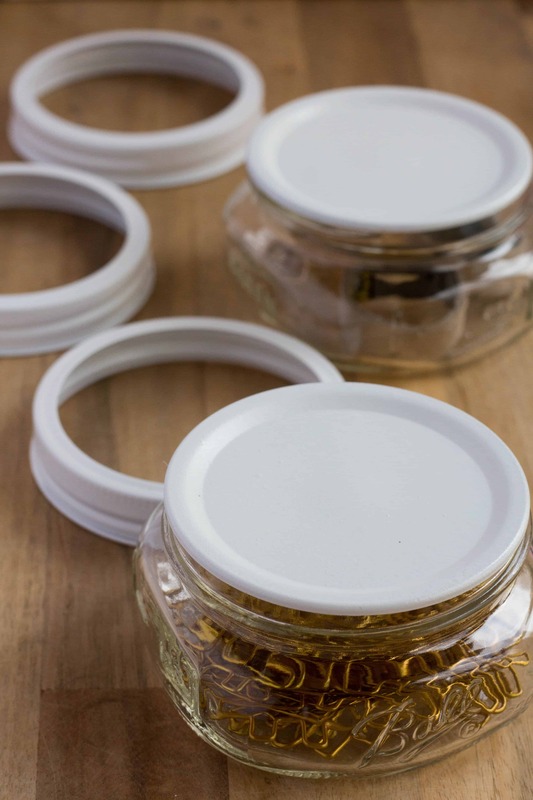 I love those short mason jars and they are perfect for supplies. The flowers on top really elevate them to something more elegant than a traditional paperclip holder. Such a great idea to paint the lids white, that really makes the soft pastel of the flower pop. I love it! I love these! They’re so fancy! I need to revisit my dollar store for some flowers, I had no idea they were so lovely!